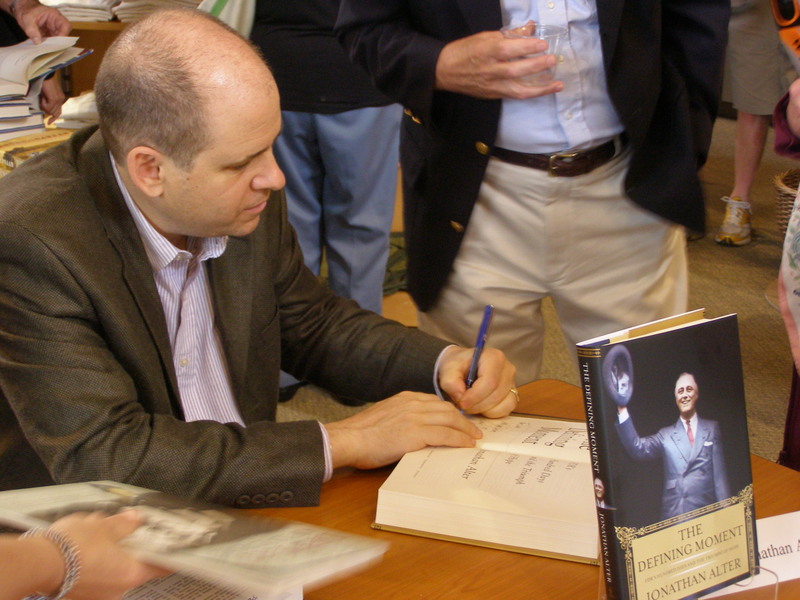 Political commentator and historian Jonathan Alter signs copies of his book “The Defining Moment” at the 2006 Reading Festival. But 2013 is also the 10th anniversary of the Henry A. Wallace Visitor and Education Center at the FDR Presidential Library and Home. We’ve greeted nearly 1.5 million visitors there. Our community has gathered in its meeting rooms year after year. We’ve held many special programs and events there. One such event is a unique program that was designed specifically for its versatile spaces. It is a program that could have never occurred in the limited programming areas of 1941 Library building. It is the Roosevelt Reading Festival — a free public program — and it too is in its tenth year. 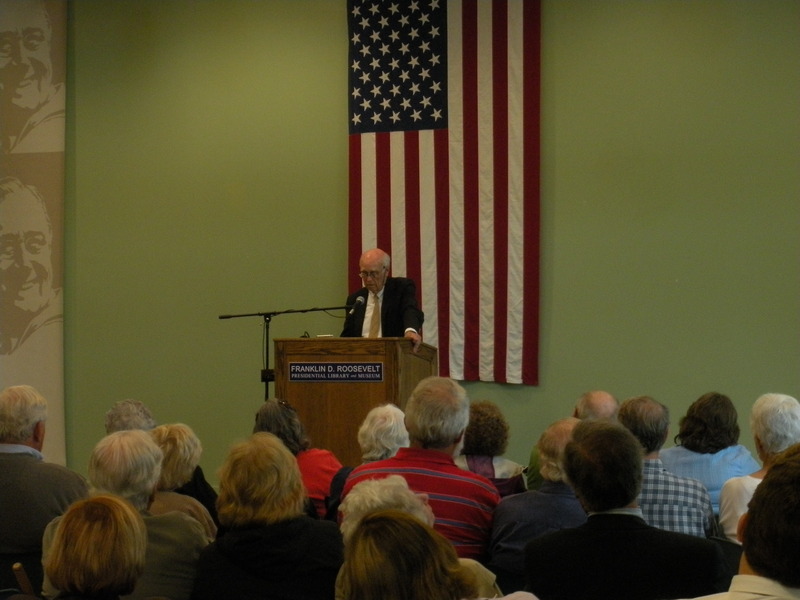 Roosevelt grandson Curtis Roosevelt speaks about his book “Too Close to the Sun” to a standing room only audience at the 2009 Roosevelt Reading Festival. In six concurrent sessions throughout the day, as many as fifteen authors of works that draw upon the Roosevelt Library archives speak about their research, their areas of expertise, and their books. Attendees can choose from many lectures throughout the day — starting on the top of each hour — and create their own experience learning about the Roosevelt era. That the Roosevelt Library has hosted over a dozen authors of new works on the Roosevelt era each year is no small thing. It is a testament to FDR’s vision that America will continue to learn from the past so long as institutions like the Roosevelt Library are accessible to its citizens. The 10th annual Roosevelt Reading Festival is this Saturday, July 27, 2013. The twelve featured authors this year include Joseph E. Persico, author of ROOSEVELT’S CENTURIONS: FDR AND THE COMMANDERS HE LED TO VICTORY IN WORLD WAR II and Eleanor Roosevelt historian Allida M. Black speaking on Eleanor Roosevelt’s 1963 work TOMORROW IS NOW which Dr. Black republished in 2012. Copies of all of the authors’ books will be available for sale in the New Deal Store. The program begins at 9:45 a.m. with coffee and refreshments. Attendees can visit the Library’s new permanent exhibition with free admission throughout the day. CLICK HERE for the complete list of authors and the agenda. 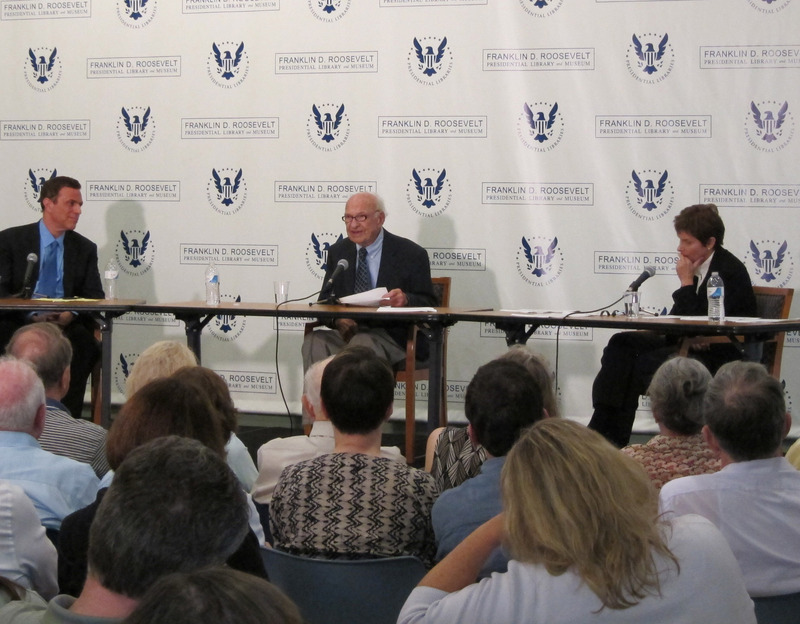 Historians Michael Beschloss, James MacGregor Burns and Susan Dunn discuss the legacy of Franklin Roosevelt at the 2011 Reading Festival.